If you have enough boxes or whatever, put each token in its own place. Personally I just divide by terrain for all the stuff that is exclusive (enemies, encounters, tokens, advance projects, threat, etc), and then a 3rd bag with all the shared components. 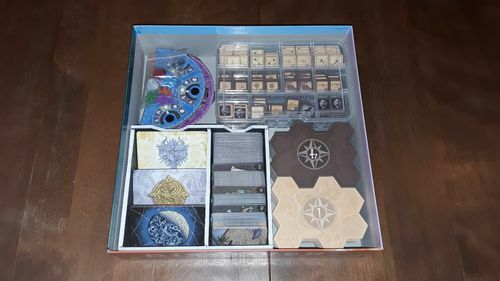 I wish FFG would start including storage trays with all their games. Other Asmodee games do it (for instance, T.I.M.E. Stories' is brilliant). And they look "cheap" enough to not cause a lot of issues in that department. I just use sandwich baggies. My box came with Island and Snow. I keep the Island tiles in one bag and tokens in another bag. I do the same for Snow. All of the shared tokens go in another bag. Cards are kept in order and rubber banded together. I keep thinking about designing a 3D printable insert to hold everything, but that seems like a ton of work for not much pay off. It's not like I play this game constantly. It's a good game, but it's a once in awhile game. Great idea until an expansion is released or you sleeve the cards and then they don't fit anymore. I don't think I've kept an insert from a single game, especially the moulded ones. Here's what I've done. I made a little tray insert for the cards using foam core board and hot glue. 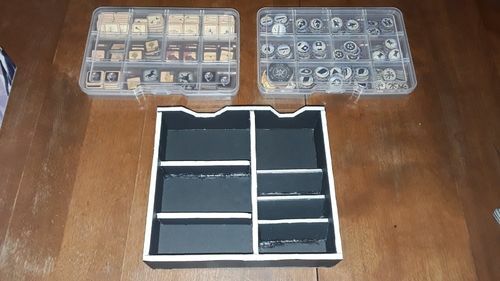 The tokens I've stored in two little organizer trays. The foam core board and trays were all purchased from the Dollar Tree for a total of $3.00 plus tax. Everything fits perfectly and the booklets lay right on top. I got a little messy with the hot glue but you can't tell once everything is in its place. 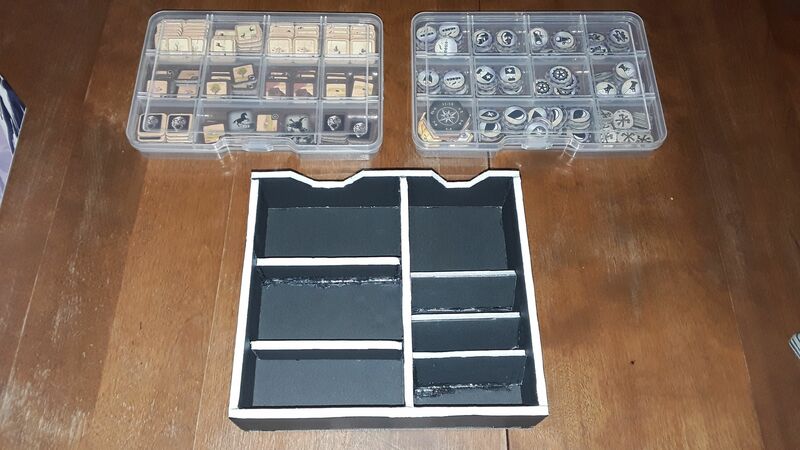 The dimensions of my card tray completely depended on the size of the storage containers for my tokens. If you use different sized containers you may want to go with a different sized card tray. The overall dimensions of my card tray are 6" x 6 3/4" x 1 7/8". I basically just made the tray to fit the empty space that was left in the box, making sure that the cards would fit into two rows. The pieces on the inside of the tray are about 1" high (about half the height of the tray). This allows the cards to sit at a slant, making them easy to identify and remove.